I don't think I've ever offered a book recommendation here, but I've been reading a lot of books lately and have come across several really good ones. In case you're on the look out for something new yourself, I thought I'd share a couple here. 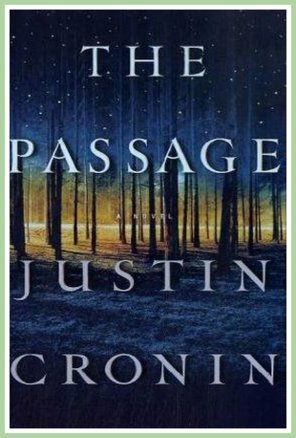 The first book is The Passage by Justin Cronin. My husband downloaded this book to his kindle and told me how much he thought I would enjoy it, but I was in the middle of another book (see below) at the time. However, by the time I'd finished my book, he'd mentioned this at least a half dozen times so I thought I'd give it a try. I'm so glad I did! It's a long book, but I just couldn't put it down. This book was named one of the ten best novels of the year by Time magazine in 2010. Here's a synopsis. 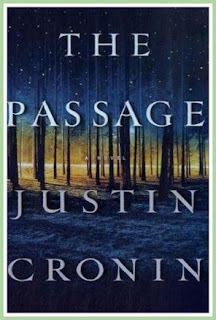 An epic and gripping tale of catastrophe and survival, The Passage is the story of Amy—abandoned by her mother at the age of six, pursued and then imprisoned by the shadowy figures behind a government experiment of apocalyptic proportions. But Special Agent Brad Wolgast, the lawman sent to track her down, is disarmed by the curiously quiet girl—and risks everything to save her. As the experiment goes nightmarishly wrong, Wolgast secures her escape—but he can’t stop society’s collapse. And as Amy walks alone, across miles and decades, into a future dark with violence and despair, she is filled with the mysterious and terrifying knowledge that only she has the power to save the ruined world. By the way, The Passage is actually part of a trilogy. The second book is already out (also a real page turner) and the third book will be out in 2014. 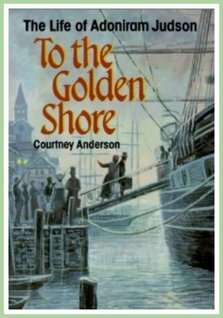 The other book I'd recommend is completely different; it's a non-fiction book called To the Golden Shore: the Life of Adoniram Judson by Courtney Anderson. On February 12, 1812, Ann and Adoniram Judson sailed from Salem aboard the brig Caravan as two of the first missionaries to go out from North America. Watching the shoreline disappear from view, they could not have foreseen the impact of their journey on the future of the Christian world mission or on the thousands of men and women who would follow in their footsteps. After a short stay in India, they carried the Good News of Jesus Christ to the golden shore of Burma. Drawing on letters and church records, Courtney Anderson paints a poignant portrait of Judson’s early life in dealing with the conflict between his desire for material success and the inner call to serve God. For Adoniram Judson the golden shore brought bitter hardships, imprisonment, and family tragedy. Yet, he never wavered in his commitment to win people to faith in Christ and to translate the Bible into the Burmese language. So those are my recommendations. If you've read any great books lately, I'd love to hear what they were! I'm always on the lookout for new authors and compelling stories. Moses is actually a great reading buddy. She loves curling up next to me while I've got a good book. Those do look like good books. I am adding them to my list! I just added my name to the waitlist for The Passage at the library. Thanks for the recommendation!